Ivory Coast is a country of extremes; a land of pulsating metropolises and pristine rainforests, vast churches and verdant hills, fancy restaurants and sprawling street stalls. Its reputation might be sullied by the recent civil war, but most areas are now stable and ripe for discovery. Coastal Abidjan is the unofficial capital and the entry point for most travellers. The French influence is clear to see here, not least in the food, which is served in some bistros with the kind of pomp you might expect in downtown Paris. These eateries are a stark contrast to the traditional maquis restaurants, which sprawl out onto the city’s bustling streets. Pull up a plastic pew, order some food and share a meal with locals. Dubbed the “Manhattan of Africa” the gleaming skyscrapers and manicured gardens of The Plateau give downtown Abidjan a decidedly modern feel. This commercial district is also home to St Paul’s Cathedral, which boasts impressive stained glass windows and great views across the city. 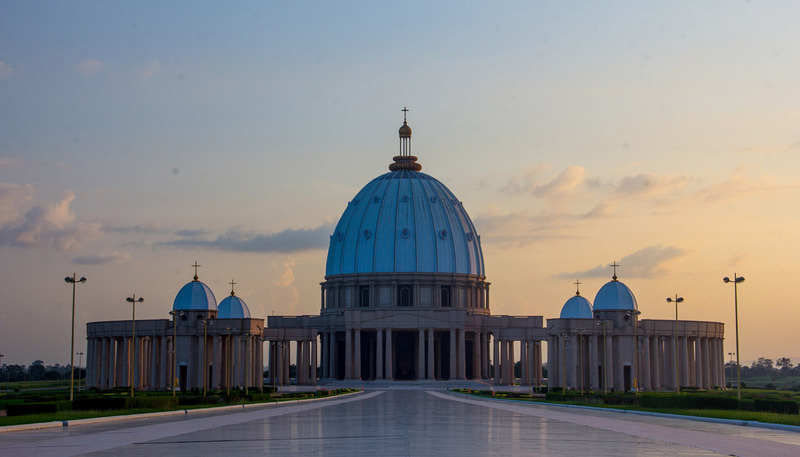 While most of the action takes place in Abidjan, Yamoussoukro is the official capital. It is notable for its massive mosque and even bigger Basilica of Our Lady of Peace, which is the largest church in the world. Football is also a religion here and watching The Elephants, the national football team, offers a memorable day out for sports fans. Ivory Coast’s true beauty really shines through when you get out of the cities. There are no fewer than eight national parks in the country, including Comoé, the largest protected area in West Africa, which boasts the most biodiverse savannah in the world. Expect to see anything from lions and leopards to aardvarks and African elephants. The pygmy hippos of Tai National Park are also a big draw for naturalists, while the beautiful beaches around San Pedro,Assine and Grand Bassam attract bathers of all stripes. Sure, Ivory Coast has had its problems, but a sanguine spirit is binding this country together again and putting it back on the map. 322,462 sq km (124,503 sq miles). President Alassane Ouattara since 2010. Prime Minister Amadou Gon Coulibaly since January 2017. Following peaceful presidential elections in 2015 the risk of a return to the levels of conflict experienced between December 2010 and May 2011 is low. However, the security situation in Abidjan and other parts of the country can deteriorate at short notice. There have been recent clashes between police and students at the Felix Houphouet Boigny university campus in the Cocody area of Abidjan. Further incidents are possible. If you’re staying longer in Côte d’Ivoire you should regularly review personal security arrangements and seek professional security advice. You should keep a stock of food and water. There’s a risk of crime in Abidjan, including violent crime, car-jackings, armed break-ins to private residences, hold-ups in the street, and theft from cars. These incidents aren’t common, but they do occur. If possible, avoid using public transport, shared taxis, or walking around after dark. On bridges to and from the Le Plateau areas of Abidjan pedestrians have been attacked and robbed even during the day. Avoid displaying your wallet; for instance, have money to hand to tip supermarket trolley attendants. In vehicles, keep doors locked, windows shut and valuables out of sight. Attacks by armed robbers have occurred on the main road between Yamoussoukro and Korogho. Attacks have been reported in the west of the country, during daylight hours as well as night. The FCO advise against all but essential travel to within 20km of the border with Liberia owing to the risk of serious violence by local militias. Fatal clashes between militias and the security forces have taken place in this area as recently as December 2015. Seek professional local advice before embarking on any travel to these areas. Take care if you intend to travel to any rural areas. You might still encounter checkpoints in and around Abidjan. You might also find official and unofficial roadblocks and checkpoints on the major routes outside of Abidjan. Take great care and co-operate with those operating them. Driving standards and road conditions in Côte d’Ivoire are poor, although they are improving in Abidjan where the road infrastructure is being upgraded. Avoid driving outside towns and cities at night as roads and vehicles can be poorly lit. You should be cautious of stray livestock that could cause a safety hazard. Grass or leaves strewn on the carriageway often means an accident or other hazard ahead. During the rainy season roads, especially those that are minor and unpaved, may become impassable. Take care when using public transport; driving standards and vehicle maintenance are poor. Unskilled drivers, poorly maintained vehicles and overloaded vehicles and inadequate lighting make driving conditions hazardous. Taxis are available in main cities, but are likely to be in bad mechanical condition. There’s an online taxi booking service operated by Africab, whose service is becoming increasingly popular. The rainy season in Côte d’Ivoire is generally from May to November. Torrential rains can cause floods, landslides and large potholes. Monitor local weather reports and expect difficulties when travelling to affected areas during this season. The Our Africa has more details. The European Commission has published a list of air carriers that are subject to an operating ban or restrictions within the European Union. You should check the list to see whether this will affect your travel. There have been no reported outbreaks of the Ebola virus in the Côte d’Ivoire. The World Health Organisation declared the end of the latest outbreak of the Ebola virus in neighbouring Liberia on 9 June 2016 and on 1 June 2016 in Guinea. You should monitor changes to travel restrictions and make sure that you have adequate and flexible travel arrangements in place for your onward journey from Côte d’Ivoire. Ocean currents are very strong along the coast. Many drownings occur each year.